… the Olympians are back! I thought that all those brilliant Olympic medal winners would be taking a well-earned rest. Perhaps sunning themselves somewhere or at least putting their feet up and indulging in a takeaway pizza and a large piece of chocolate fudge cake. But it appears there is no rest for the elite and a handful of our heroes were back in competition on Sunday at Birmingham’s Alexander Stadium as part of the Aviva Birmingham Grand Prix. And I was there to see them! Long jump gold medallist, Greg Rutherford, high jump bronze medallist, Robbie Grabarz and 400m silver medallist, Christine Ohuruogu were all competing, along with several other London 2012 medallists from other countries. 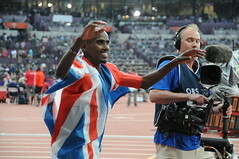 But the highlight was watching Mo Farah win the 2 mile event with a fantastic sprint finish! The stadium went wild. So these high-achievers don’t sit back and rest on their laurels after a success and they don’t give up when they fail either. Do you? When an editor accepts a story or you get placed in a competition – what do you do? Spend days telling everyone about it or just get back to your desk and write something else? When the rejections come in do you throw in the towel and decide to write nothing more that week? Or do you get back to your desk and write something else? As writers we have to be like athletes – constantly training the parts of our body that make us produce of our best. So whatever life throws at you, good or bad, get back to your desk and write something! The more you use that writing muscle the better it will become. Lecture over. I’ll now attempt to take a piece of my own advice … and go do some writing! This entry was posted on August 29, 2012, 11:00 am and is filed under Non-writing, Writing. You can follow any responses to this entry through RSS 2.0. You can leave a response, or trackback from your own site. Great post Sally and sound advice for all writers. We can never afford to sit back and bask in any glory (if we’re lucky) or wallow in rejection (far too often). And besides if we don’t get on with it then we can’t really say we’re writers… On the same theme I believe a famous golfer (sorry can’t remember his name) once said ‘the more I practise the luckier I get’ – this translates well to writing! I like your golfer’s quote, Tracy. It’s often said that writing is a numbers game and the more you submit the greater your chances of publication. The golf quote is a good one! Thanks for the post, Sally – great advice!